Telecommuting is an effective way for individuals to get work done outside of an office. This can be facilitated through either a home office or a co-working environment common to big cities. However, when you are outside of an office environment, you are more susceptible to a variety of challenges, while also having more opportunities to grow at what you are doing. This is best done through having an adequate amount of tools at your disposal to make sure you can get the job done. Today, we will take a look at five tools that can promote effective telecommuting. While Skype is the popular way for teams to keep contact, not all individuals favor it for business communication, including as a telecommuter. Trillian is that professional alternative for telecommuters. Along with the Trillian communication system, you are also able to connect other forms of instant messaging tools and services into the application, which will allow you to communicate all in one formal place. 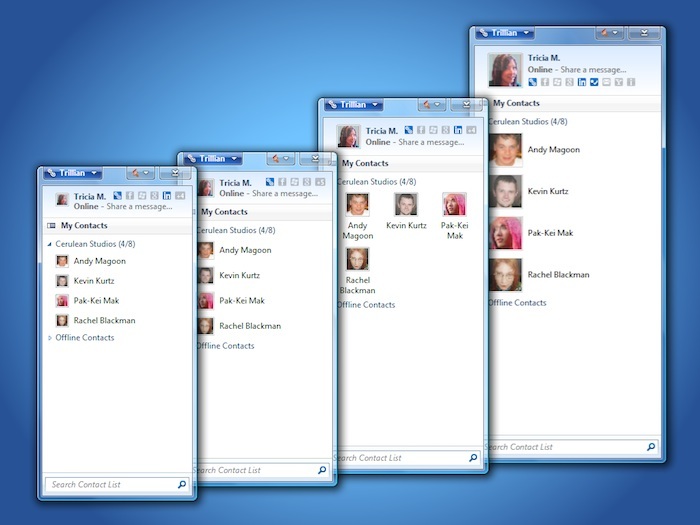 Trillian is available across various platforms, including both mobile and desktop. Cost: Pro available for individuals at $20 a year or $60 a lifetime. Business plans start at $2 a month per user, and includes the ability to create an internal unique messaging service for your team. If you are a telecommuter as part of a larger company, the biggest hurdle that is encountered is being unable to keep contact with other team members. Even if you are able to constantly communicate by email, being able to see each other through cam or face-to-face is hard to continually have available. 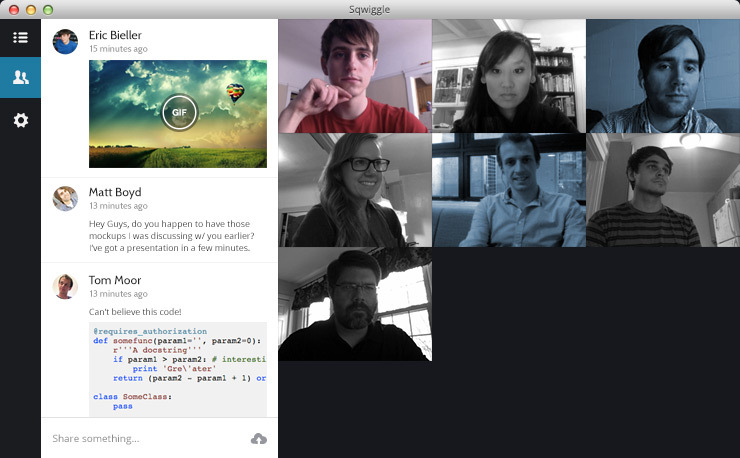 Sqwiggle makes video conferencing easier than ever and only a click away for team members. Squggle puts the social back into telecommuting. Even outside of team meetings, Sqwiggle can be a great way for team members to keep up with each other’s daily life, take time to talk about just anything, and even eat lunch together as a team like a brick-and-mortar office. Especially for individuals just start out as a telecommuter or freelancer, the biggest fret that comes with the job is the inability to focus in the new work environment, even if it’s in the familiarity of your home office. Switching your mind into work mode can be difficult. 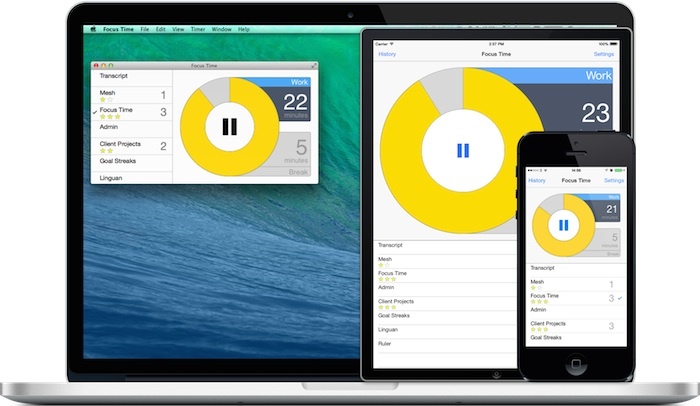 Focus Time hopes to help, making use of the Pomodoro method that sets a timer for each task, with a scheduled break in between. This makes use of the cognitive want for us to reach a goal (time), which in return actually contributes to you efficiently getting work done. Dropbox is an all-round helpful application for individuals who are telecommuting. First off, if you find yourself only telecommuting a couple of times a month or certain days of the week, it can be a great way to work in your work and home office computer. Dropbox links them both, providing you with the ability to simply save files to the cloud and have them accessible at “location-b”. Shared folders also allow you to have a central ground for team members to save relevant files. Cost: Starting at Free for 2GB, or $9.99 a month for 100GB. Business plan is also available. 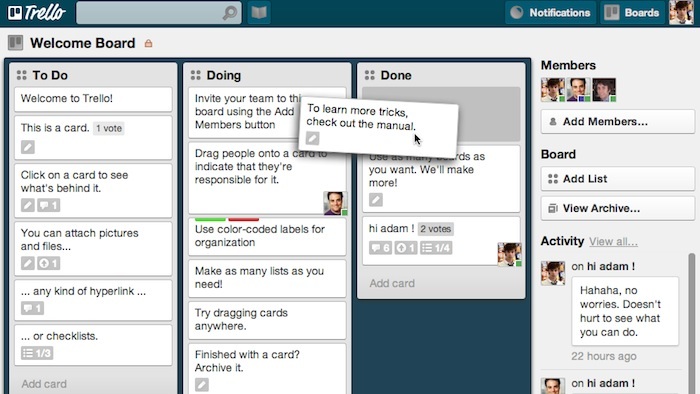 While many telecommuting software focus on the general operation of a team, ensuring that communication is maintained and work is assigned, Trello stand out of the pack. The software allows project managers to focus on the iterations for a specific project, allowing the team to focus more on the smaller scale tasks at hand. With Trello, even telecommuters are able to show others on the team what they are doing with their time and how far they are along on a project.